It’s not a spelling mistake – we have a SILVER Krugerrand! Whatsmore, we have a PLATINUM Krugerrand plus EIGHT different weights of gold coin, including an unbelievable 50 ounce gold coin. Sets are also available. All of this is to celebrate 50 years of the classic Krugerrand 1oz gold coin (1967-2017). 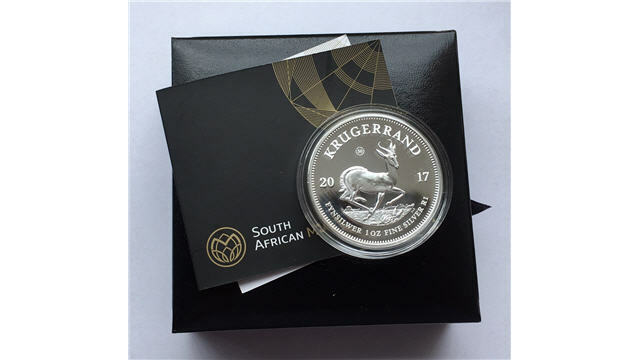 The South African Mint has issued a series of new coins which see the 1oz Krugerrand minted for the first time in silver. 2017 Krugerrand 1oz Fine Silver Premium Uncirculated. The proof version has already been sold out by the mint. The platinum proof has also been sold out. The designs are very similar to the standard gold 1oz Krugerrand, but each coin is clearly marked as to its metal and its weight. Although the gold coins do not show the denomination, due to South African law non-gold coins must and so the silver and platinum coins are marked ‘R1’ for one Rand. The gold coin is offered in eight variants, including an incredible 50 oz gold coin! A variety of sets for anniversary, prestige and fractional sets have also be issued, as well as other commemorative gifts. 2017 50th Anniversary Krugerrand Set. This has the 50oz gold coin, a first for South Africa. Only 5 of these sets are available. 1967 – 2017 Vintage Krugerrand 5 Coin Set. 1967 (reissued) 1oz gold, 2016 1oz gold, 2017 1oz gold, 2017 1oz silver and 2017 1oz platinum. 1967 – 2017 Vintage Krugerrand 3 Coin Set. 1967 (reissued) 1oz gold, 2016 1oz gold and 2017 1oz gold. 2017 Proof Krugerrand Prestige Set (6 coin). All the gold from 1oz down: 1oz, 1/2oz, 1/4oz, 1/10oz, 1/20oz and 1/50oz. 2017 Proof Krugerrand Fractional Set (4 coin). Gold fractions 1/4oz, 1/10oz, 1/20oz and 1/50oz. 2017 Proof Krugerrand Fractional Set (3 coin). Gold fractions 1/10oz, 1/20oz and 1/50oz. All of these coins and sets will be very collectable, which in other words probably mean expensive! Our thanks to Max Hughes (mjhughescoins.com) for supplying us with the photographs. M J Hughes Coins are interested in buying any krugerrands you may like to sell. 2017 SOUTH AFRICA 1 OUNCE SILVER KRUGERRAND IN MINT CONDITION IN CAPSULE. 2018 South Africa KRUGERRAND 1oz .999 Silver bu coin in rimless capsule.